Can You Sign a Check Over to Somebody Else? When a check is payable to you, you’re the only person who can do anything with it. If you don’t want to cash a check yourself or depositing the check is not an option, you might be able to sign the check over to somebody else. That person would then deposit into their account or get cash. 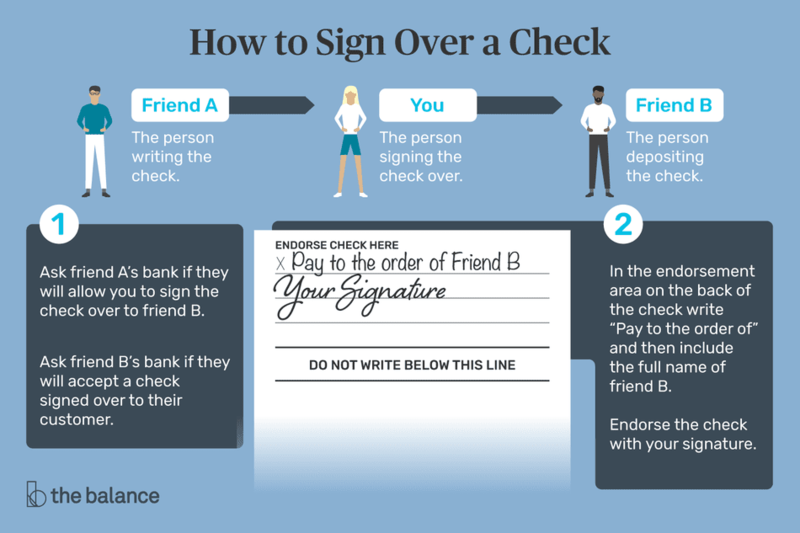 To sign a check over to somebody else, verify that a bank will accept the check, then endorse the back of the check and write "Pay to the order of John Doe." Use the other person’s name instead of John Doe. Then, pass the check on to that person so they can deposit or cash the check. Banks might not be willing to accept checks that have been signed over to a third party (that is, somebody besides the check writer and the original payee). It’s perfectly legal to try, but banks aren’t required to honor your instructions. They may have policies against this practice, or they may think that a third-party check is a red flag—so they’ll refuse to deposit or cash the check. Ask before you endorse: If you insist on signing a check over to somebody else, have them check with their bank before you endorse the check. You don't want to add extra signatures and names to the back of the check (which will create confusion and delays at the next place you try to cash the check). Find out if it’s allowed and what the requirements are. For example, things might go more smoothly if you go to the bank with the person depositing the check (bring ID, of course) so the bank has more confidence that nothing fishy is going on. Banks are essentially giving your money to somebody else when you use this approach. Unfortunately, the risk is often too great for them to accept. They can’t verify your identity or your signature—they just have to take the third party’s word for it. Signing a check over to somebody is not an ideal solution, and sometimes it’s simply not an option. The strategies below might be slower than endorsing a check to someone else, but at least you can be confident that they’ll work. If you need to pay somebody with money you’ve received by check, try cashing or depositing the check yourself to avoid any hassles. You can typically get the first $200 of funds from a check within one business day (or the first $5,000 if it’s a cashier’s check). There are numerous ways to send money online for free, and those methods might be a lot easier than dancing around bank policies. If you don't have a bank account or any other way to handle checks, open an account. Yes, banks can cost money, but not having an account probably costs you more—in both time and money. There are several ways to get free checking accounts, especially at local credit unions and online banks. Never used a credit union? Learn how they work. See your options for finding free checking. Find out why you should try online banking. If it’s simply not an option to open a bank account, you could try a check cashing service, but those fees are typically quite high. Several retail stores have been known to cash checks for free, especially tax refund checks. If your bank is inconvenient, two options below might make your life easier. Mobile check deposit allows you to take a picture of a check—often until late into the evening for a same-day deposit. Then you can withdraw cash or send money electronically. Credit union customers can often use branches of other credit unions (assuming they participate in the shared branching network). If your bank doesn’t offer mobile deposit (or you’re looking for an inexpensive solution), prepaid debit cards might meet your needs. Just be wary of high-fee cards. If you’re trying to pay without cash because you’re concerned about theft (in the mail, for example), write a check or pay with a money order instead. If somebody asks you to deposit a check written to them, think carefully before you do so. You are risking your own money (and your good standing at the bank) if you agree. If the check bounces for any reason, your bank will demand that you replace the funds, even though the check was written to your friend—by somebody else entirely—and you were just doing a favor. Your account will go negative, or the funds will be taken from your balance if it's a bad check. You can try to collect funds from your "friend," but this is often difficult (and sometimes strangers ask you to cash a check as part of a scam). How can you lose money by helping somebody? Your bank will often allow you to get cash from a check immediately (or the funds will show up in your available balance, making it look like you can spend all of that money if you want to). Later, your bank actually processes the check and tries to collect money for it. It can take days or weeks for your bank to find out that a check was bogus, so don’t hand over cash unless you really trust the person you're helping. Unfortunately, if you cash a check for somebody else and the check is bad, nobody (such as your bank) will reimburse you. You'll have to ask that person—if you can find him—and possibly bring legal action to collect the money.